"The cross to which he was nailed was a symbol, as the Apostle declares, “Christ has redeemed us from the curse of the law, being made a curse for us: for it is written, Cursed is every one that hangeth on a tree: that the blessing of Abraham might come on the Gentiles through Jesus Christ,” (Gal. 3:13, 14). 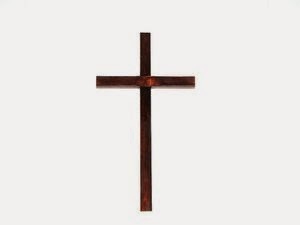 In the same way Peter says, that he “bare our sins in his own body on the tree,” (1 Peter 2:24), inasmuch as from the very symbol of the curse, we perceive more clearly that the burden with which we were oppressed was laid upon him. Nor are we to understand that by the curse which he endured he was himself overwhelmed, but rather that by enduring it he repressed broke, annihilated all its force. Accordingly, faith apprehends acquittal in the condemnation of Christ, and blessing in his curse. Hence it is not without cause that Paul magnificently celebrates the triumph which Christ obtained upon the cross, as if the cross, the symbol of ignominy, had been converted into a triumphal chariot. For he says, that he blotted out the handwriting of ordinances that was against us, which was contrary to us, and took it out of the way, nailing it to his cross: that “having spoiled principalities and powers he made a show of them openly, triumphing over them in it,” (Col. 2:14, 15). Nor is this to be wondered at; for, as another Apostle declares, Christ, “through the eternal Spirit, offered himself without spot to God,” (Heb. 9:14), and hence that transformation of the cross which were otherwise against its nature."